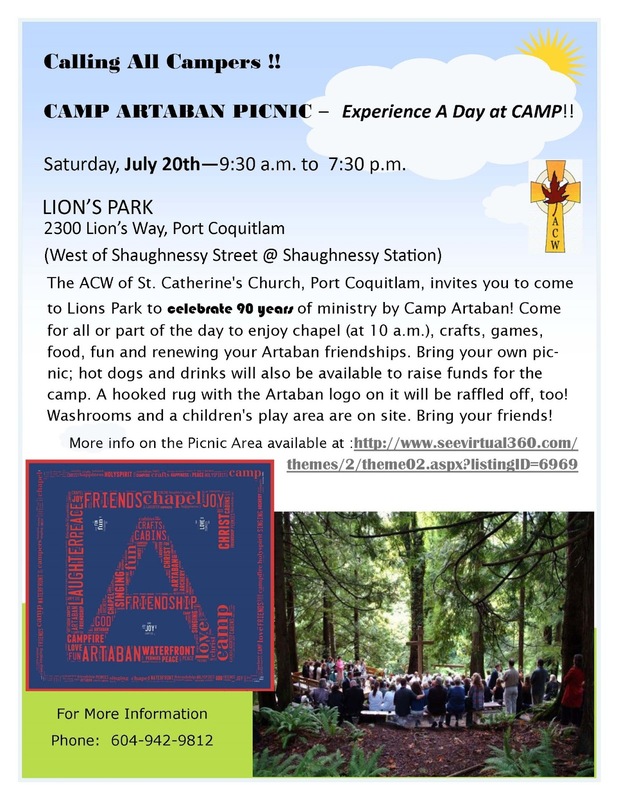 St. Catherine’s ACW is hosting a Picnic in order to raise awareness and support for Camp Artaban. ACW members were distressed to hear that, in this 90th year of its existence, Camp Artaban would not be opening its doors to campers due to financial difficulties. The ACW invites everyone to help by attending upcoming celebration – “CAMP ARTABAN PICNIC – Experience a Day at Camp” – on July 20, 2013 (rain or shine!!!!). The picnic will be held at Lion’s Park, 2300 Lion’s Way, Port Coquitlam (west of Shaughnessy Street at Shaughnessy Station). Learn more about Camp Artaban and how you can help at www.campartaban.com .